American made dog toys may present a safer alternative to toys imported from outside the USA. As a consumer, you've probably heard a lot about products made outside of the USA containing unsafe levels of lead and other toxins. The reports cite lead in everything from dishes to children's toys. Disturbingly, lead has also been found in a variety of dog toys. Since virtually everything a dog plays with winds up being chewed in its mouth, owners are genuinely concerned about the situation. To top it off, the dog toy market is dominated by foreign manufacturers, and this makes it quite difficult when it comes time to shop for Fido's next squeaky. Outside of the USA, manufacturing guidelines can be less stringent, yet the toys are still available for import, and store shelves are flooded with them. 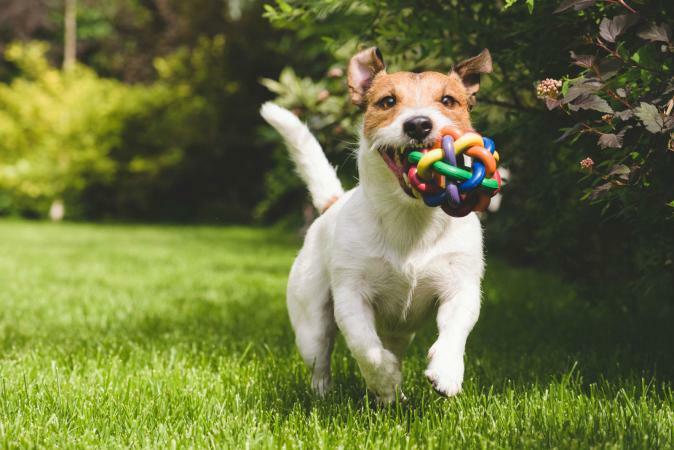 To date, there is no regulating body governing the safety of dog toys, so it's hard to define what constitutes a safe level of lead in these products. Some people believe that pet toys should meet the same safety guidelines as children's toys, since humans regularly come in contact with these items anyway. On the other side of the issue, many foreign manufacturers and importers argue that the levels of lead in their products are perfectly safe for pets. Considering that lead builds up in a dog's system, just as it does in humans, it seems that any repeated exposure could lead to lead poisoning eventually. Most dog owners don't consider this an acceptable risk. The following websites feature an assortment of American Made dog toys. Puppy Kong Teething Stick: Teething puppies are bound to enjoy this chew toy made from Kong's teething rubber. The toy helps clean teeth and can even be loaded with tempting treats, a signature of the Kong line that keeps dogs occupied longer. Plush Bone: If your dog prefers a toy she can cuddle up with, check out the selections from His-N-Hers™. The plush bone is very popular and is available in pink or blue. You can choose other shapes too, including footballs and heart pillows. 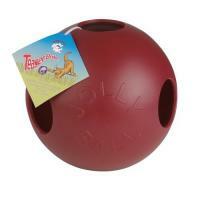 Jolly Pets Teaser Ball: This toy provides twice the fun with two balls combined in one. The durable outer ball has viewing holes to tempt your dog with the smaller ball inside. Your dog can get inside to paw the smaller ball, but he can't get it out. That won't stop him from trying! Bungee Ball Tug: Two tennis balls are connected by a durable, nylon-covered bungee cord. You can use this toy to have a tug of war with your favorite pup, or two dogs can tug between each other. The Wonder Stick: Another enticing tug toy, the wonder stick is a long nylon cylinder stuffed with real sheepskin and polyester to create a scent attraction for your dog. The tug has a handle for you on one end so you can play along too! Toss-N-Treat: Teach your dog to fetch and develop basic Frisbee skills with this flyer. This sturdy nylon toy has a secret pouch you can stuff treats in to make it even more desirable to your dog. An inner PVC ring makes this flyer suitable for water play without the treats. Nylabone.com manufactures some of the leading dog chew toys on the market. The majority of their products are made at their Neptune, New Jersey plant, so check for the "Made in the USA" label. Nylabone chews: Each of these chew toys is made of nylon that frays rather than break off in chunks. Any tiny particles that separate from the bone pass harmlessly though your dog's system. Chews come in many shapes, from classic bones to rings. Some varieties are flavored to taste like bacon, chicken or chocolate. Flexible Chews: This category of chew toys is made from a combination of nylon and thermoplastic polymer that offers long-lasting chewing satisfaction. Again, the toys come in various shapes, including tugs, and many are flavored. Sold at West Paw Design, Eco Friendly Toys are also manufactured in the USA. Eco Bones: Soft and chewy, these bones look like a fleece dog toy, but they're actually made from 85 percent recycled fibers that are safe for your dog and better for the environment. The Zisc: These flying discs are made of Zogoflex®, a highly durable material developed by West Paw. The Zisc is similar to a Frisbee, but the material is gentler on your dog's teeth and gums. If buying American is important to you, be sure to check the product label of any dog toy you consider buying. In these days of out-sourcing, never assume that any traditional American label is still manufactured in the USA.